These daily Advent reflections are each devoted to one Christmas carol (or canticle) to prepare us for God dwelling among us– then, now and forever more. Tell out, my soul, the greatness of the Lord! in God my Savior shall my heart rejoice. Tell out, my soul, the greatness of his Name! his holy Name–the Lord, the Mighty One. Tell out, my soul, the greatness of his might! Powers and dominions lay their glory by. the hungry fed, the humble lifted high. Tell out, my soul, the glories of his word! Firm is his promise, and his mercy sure. to children’s children and for evermore! Mary’s life was turned upside down by the news she received and she sings out her acceptance of her part to play in bringing God down to His people. coming from the most humble of women and circumstances, owning nothing, knowing richness by giving Himself away. He conquers by showing mercy: our hearts and souls are saved through His death, not by the deaths of enemies. He keeps God’s promises: He is the covenant with Abraham fulfilled. Tell out, each of us, from the soul, the good news. We are given voice by His unnumbered blessings. of the humble state of his servant. he has scattered those who are proud in their inmost thoughts. but has lifted up the humble. but has sent the rich away empty. I’ll look forward to reading these every morning, Emily! Emily, this is beauiful. When I finally came to understand from a human perspective what occurred in the life of this young Jewish girl (probably in her early teens), I fell in love with her. She became my Mother, someone to whom I could go when I was physically and emotionally abused. 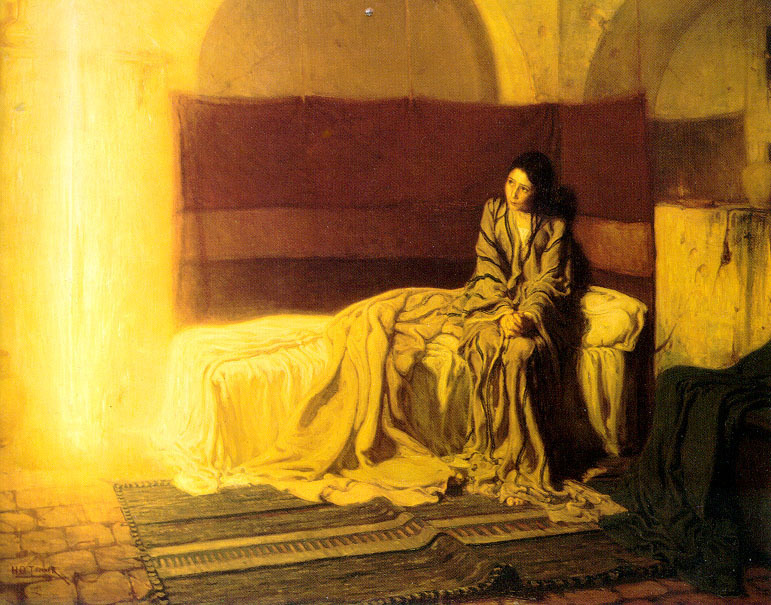 The account of the angel’s Annunciation to her prior to the hymn, Magnificat, is a study of unparalleled abandonment to God’s will. Her humility, praise to God, and her profound trust and love are difficult for us to fathom I think — particularly considering the social implications that her “Yes” had for her at that time in Jewish history. I view the Magnificat as a stunning history of God’s revelation to us — for that time, for all time — for His actions leading up to our salvation and beyond when he will fill the faithful with all good things and judge evildoers with His righteousness.